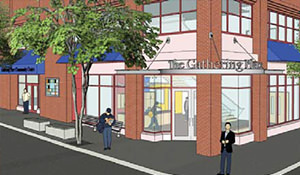 For City of Vancouver Facilities, The COLBORNE ARCHITECTURAL GROUP Pacific was retained in January 2011 to carry out a two-phase project at the City’s heavily-used, inner city community centre – The Gathering Place. With a $200K budget, Phase 1 repurposes approximately 1,200 sq. ft of 2nd floor space originally designed as a ‘whirlpool/massage therapy’ area. Future Phase 2 involves creation of a new, more open and accessible main floor entry with improved security features and requires replanning of several existing 2nd Floor areas including badly needed Washroom facilities. The feasibility study identifies future cost and construction phasing options with the objective of optimizing a variety of badly needed community centre facilities. 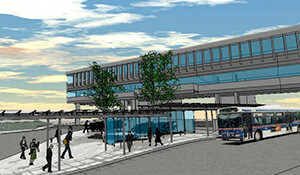 designed a new accessible elevator, temporary bus loop, user parking and retail at the Scott Road Skytrain Station; it has worked on phased improvements to the Burnaby Transit Centre North complex; and it has coordinated major upgrades and alterations for the Transit Police service at their headquarters on Columbia Street in New Westminster. Moberly Community Park is located at 61st and Prince Albert Streets in south-east Vancouver. The COLBORNE ARCHITECTURAL GROUP Pacific was retained to renovate and update the existing 1958 wood frame/post and beam community hall to support increased public use as an ‘artist’s centre’ and for regular community events, particularly by the active south-Asian community. Scope also included extensive redesign of dated public washrooms to support a growing variety of outdoor Park Board programs. For Simon Fraser University’s main Burnaby Campus, the COLBORNE ACHITECTURAL GROUP Pacific was asked by Campus Planning & Development to study options to partially cover an existing ‘Transit Centre’ island with weather protection for transit users waiting for regular bus service. The triangular-shaped, sloped site is concretepaved and located at the confluence of main arterial roads, connecting with the campus’ central covered pedestrian spine and adjacent academic buildings. 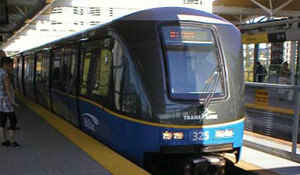 BC Transit provided primary design criteria for the anticipated 150 person peak-time usage requiring access by two articulated buses. After reviewing design alternatives and costs, an open-sided steel-frame structure with structural glass ‘butterfly’ panel roof was selected for the protected linear space required to access bus loading positions.